Prof says voice-command systems may distract drivers more than cellphones. Isobel Markham | The Salt Lake Tribune AAA representative Russ Martin demonstrates the instrumented vehicle fitted with technology to measure levels of cognitive distraction. Isobel Markham | The Salt Lake Tribune AAA representative Russ Martin wears the EEG cap to measure brain activity and a head-mounted device displaying a flashing light to measure response time. Landover, Md. • Big engines and cushy seats are not enough for today&apos;s automobile buyers. They want cars fused with computers. Machines that respond to their voice. Access to the Web while changing lanes. Automakers are responding, but these latest "infotainment" features may be more fun than safe. In fact, a new study by University of Utah psychology professor David Strayer indicates they can be downright dangerous  that talking to your car while driving may be more distracting than chatting on a cellphone. AAA, a leading motorist organization, backed the research, concerned about the proliferation of the new auto technology and how it could lead to widespread driver distraction. Around 9 million cars are now fitted with voice-recognition systems and this number is forecast to soar to 62 million in 2018. "We think that if we are loud enough and persistent enough then we can save some lives by educating people and making them think twice about using these systems when they get behind the wheel," said AAA spokesman Jacob Nelson. 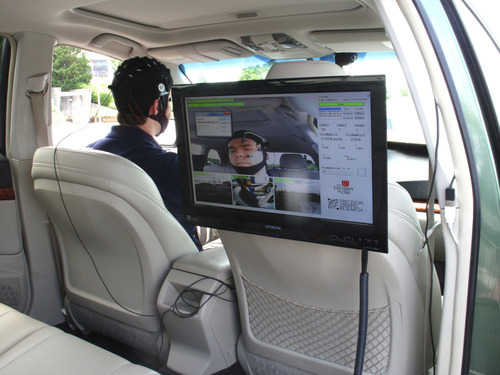 AAA hopes Strayer&apos;s research may prod the auto industry into making the voice-recognition systems safer and encourage drivers to use the devices judiciously. The group is not asking for laws banning or restricting their use at this time. "Now is the time to really think more carefully about this and to more responsibly develop these technologies," Nelson said. Demonstration • On Tuesday afternoon members of the media gathered in a windy parking lot in the shadows of the FedEx Field on the outskirts of Washington, D.C., for a demonstration of Strayer&apos;s research methods. On display were the EEG cap used to measure brain-wave activity and the original Subaru used in the study, which Strayer&apos;s son, Kyle, a University of Utah student, had driven from Utah. But the study participants, all Utah residents, didn&apos;t start behind the wheel. Strayer asked them to perform eight tasks, ranging from listening to the radio to solving a math problem to operating a speech-to-text device, while staring at a cross on a blank computer screen. He then had groups do the same tasks while operating a driving simulator and while driving the Subaru around a 2.75-mile loop in the Avenues area of Salt Lake City. The results were clear in all three tests: Those hands-free speech-to-text devices were much more distracting than you might think. In fact, they&apos;re worse than talking on a cellphone. He scored the distraction on a five-point scale, where listening to the radio received a 1.21, talking on a hand-held cellphone got a 2.45 and interacting with an infotainment system registered a 3.06. "You&apos;re going to fail to notice things," Strayer said. "You&apos;re going to suffer from inattention blindness, and that&apos;s even if it&apos;s a purely voice-based system where your eyes are on the road and your hands are on the wheel." 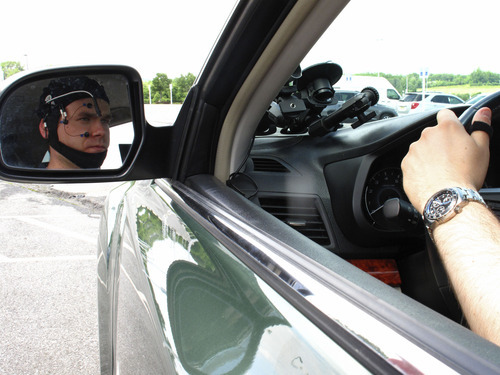 Distracted-driver research • Strayer is no stranger to the field of distracted-driver research. Along with his colleagues at the Applied Cognition Lab at the University of Utah, he has studied the issue of driver cellphone use for the past decade. In 2007 a study by Strayer and his colleague Frank Drews found that using a hands-free cellphone significantly affects a driver&apos;s ability to react to his or her surroundings and slows response time. The researchers then concluded that drivers using either hand-held or hands-free cellphones were as impaired as drunken drivers at the legal blood-alcohol limit of .08. The new research shows that distracted drivers don&apos;t move their eyes from the road as often, getting a form of "tunnel vision." It means drivers check their mirrors less frequently and are less likely to notice peripheral hazards. "Even the things that you&apos;re looking right at, sometimes you don&apos;t see," Strayer said. Car manufacturers, though, see potential profits and consumer expectations, and while most advertising focuses on the convenience of the newly equipped vehicles, at least some automakers imply that the hands-free devices are safe. In January, Chrysler&apos;s UConnect infotainment system won the Technology of the Year award from AOL Autos for providing "a solution to distracted driving." And a separate AAA study indicates that half of Americans believe that built-in Web-based systems carry zero risk. Such assumptions regarding driver safety are, according to Strayer&apos;s research, highly dangerous. "Just because a technology makes it hands free doesn&apos;t make it safe," he said. "They may take your eyes off the road or your mind off the road sufficiently that you&apos;re an impaired driver." The Automobile Alliance, a group representing major automakers like Ford and Chevrolet, issued a statement Tuesday taking issue with Strayer&apos;s research, saying it is "misleading" to suggest that hand-held and hand-free technology are equally distracting. "The Alliance urges all drivers to keep their eyes on the road and hands on the wheel, and integrated hands-free systems can help drivers do so," the statement read. Strayer said more study is needed and that his team is engaged in the second phase that will look more closely at different types of voice-command systems. He expects to release that data in early 2014.